Hello and welcome to another fun blog tour 🙂 THE KEY TO EVERYTHING is both my first new adult novel and my first self-published novel. I got the idea for the book in December of 2014 when I was on a cruise with my sister. We had traveled to Thailand together several years ago and I loved the friendly people and beautiful country. For years, I had wanted to set a story there, but I hadn’t come up with the right idea. The story practically wrote itself—I started the first draft on Christmas and finished it on Valentine’s Day of 2015. But then I got bogged down in promoting LIARS, INC. and writing/revising two books for 2016 and two books for 2017. And so THE KEY TO EVERYTHING had to wait until I was caught up to be revised and edited and proofread and revised some more. Then with the help of my agent I navigated the murky self-publishing waters for the first time. It feels like it took forever to get everything set up, but I am so happy to be bringing you this book set over Winter Break now, when so many of you are probably snowed in and/or exhausted from the holidays and could use a vicarious vacation to a sunny and gorgeous place. Here’s a mood board to show you some of the sites Oakland, Morgan, and the US soldiers they meet in Thailand end up visiting. Over the span of two weeks they’ll go from Bangkok, to the beaches of Phuket, to the jungles of Chiang Mai, to the ruins of Sukothai, and then back to Bangkok for more romantic drama. I hope you check out this story, and I hope it makes you smile. Be sure to stop by Adventures of a Book Junkie tomorrow for an excerpt from Oakland’s time in Bangkok and a chance to win an amazing handmade souvenir sent directly to you from Thailand! Paula Stokes wrote a New Adult novel, y’all! I’ve been reading her YA books for years and she has grown to be a favorite author of mine so when I heard something a little spicier with college age characters was on the horizon I jumped at the chance to read it. I found the writing to be very comparable to her YA works. The author is excellent at creating these characters that are quite flawed but very likable. Characters you can’t help but to root for and that’s exactly the type of character Oakland is. 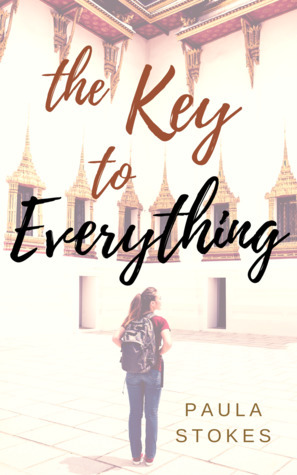 After a few lackluster relationships throughout college, she becomes obsessed with the idea of ‘The One’ and feeling like she already had her chance at true love in high school and gave it up before leaving for college, an idea only made worse when a fortune teller encourages the thoughts in her mind by declaring him the ‘key to everything’. She tries relentlessly to find her old boyfriend Seth but strikes out at every turn. In an effort to distract her from the obsession, her best friend Morgan offers up a trip to Thailand for the Holidays. Despite Oakland’s often misguided actions, she was still a character I easily connected with and I grew to love the romance hanging in the air of Thailand. I am so very happy the author decided to try out New Adult and hope she writes more in the future. Definitely check this one out! So glad to hear this was a hit for you, Sarah. I like her books a lot too and I love the sound of the setting here. I’m always up for a good travel book. Ugh! Sorry for the extra “h” in your name! I read this for Paula and felt basically the same way you did. I now want to read more of her books this year but am hoping the YA doesn’t have such explicit scenes. They don’t! Just this NA for the explicit scenes. I am so excited about this book, I actually pre-ordered it (I never do this). Wonderful review! Yay! I’m not huge on pre-ordering so I get how rare and awesome it is when you find a book worth doing it for. I had no idea Paula Stokes was even writing this – I hadn’t heard of it until now! I love her writing and have read several of her books that I simply couldn’t put down, so I’m super excited to read about this one – definitely heading off to buy this one on Kindle ASAP! Great review, and so happy to hear that you liked it! Kelly @ Here’s to Happy Endings recently posted…Batman: Nightwalker by Marie Lu – Review and Giveaway! Yay! Definitely grab this one up!